Dual intensity switch, allows longer viewing without damaging sensitive samples. Hinged UV blocking cover comes with all models. This cover offers the user UV protection when down. An UV blocking faceshield should still be used with transilluminator to maximise user safety. 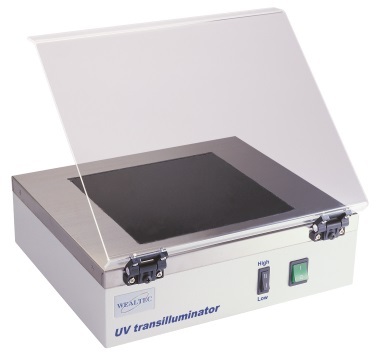 UV Transilluminator, 312nm, UV-B middle wave, 20 x 20 cm viewing area Buy Online!